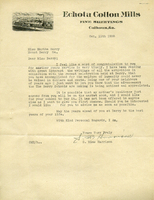 S. Mims Harrison expresses her congratulations to Martha Berry about the success of her schools, and informs her that her mother's house directly across from the schools will be for sale soon, and she would like the schools to have the first shot at it. 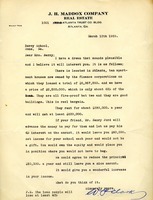 This is a letter to the Berry Schools in which George (E. W.) Hollister expressed that he could no longer subscribe as much as he used to due to a decrease in his income from both his real estate and his lumber businesses. 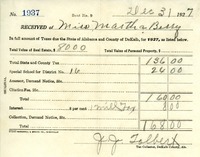 A letter to Miss Martha Berry notifying an expectation of possession of a house currently occupied. 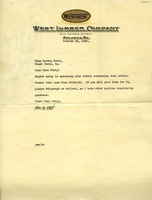 Martha Berry writes to Hale Real Estate Company, thanking them for a gift she received. 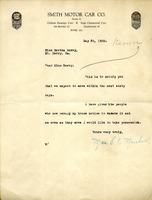 She mentioned how the donator (W. D. Hale) was one of Berry School's very own and she appreciates the support and hopes it continues in the years to come. 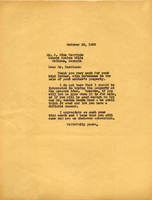 Lyda Saxon writes to Martha Berry about the real estate problem in Florida. 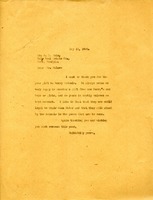 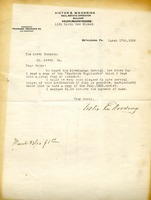 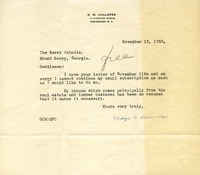 Victor E. Woodring writes to The Berry Schools, enclosing $1.00 to purchase a copy of The Southern Highlander, which he first read on board the Birmingham Special.